When I was a kid, I thought Firefly was just a gray repaint of Storm Shadow. I was kind of dumb. This one's a repaint, but has no parts in common with the Cobra ninja. No one knows what his real name is or what he looks like. Firefly is known by his work. Expert in all NATO and Warsaw Pact explosives and detonators. Always places his charges in the one place that affords maximum damage. There is no question about his infiltration skills since no one has ever reported seeing him enter or leave any target area. Firefly wasn't a major character on the cartoon - he only appeared in 14 episodes, and only spoke in half of those. It's not too surprising, however: his character premise is that he's an unstoppable, uber-competant professional, which wouldn't really mesh with (animated) Cobra's rep as a bunch of bumbling halfwits one step above the Three Stooges. Imagine you have an army of guys who can't shoot straight, led by a craven megalomaniac, and then one untouchable hitter with a 100% kill rate. Kind of throws off the dramatic balance, huh? 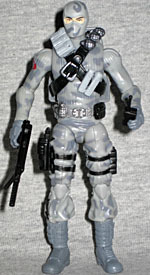 The figure is wearing Firefly's classic "urban camo" pattern, which is much more likely to allow you to go unnoticed than what an Alley Viper wears. He got a few different costumes in later years, but none was quite so utilitarian as this. Gray boots, gray pants, gray shirt, gray mask. His shirt has the lines of a thick sweater, and his mask is clearly some sort of high-tech cloth, not just a ski mask or ninja hood. 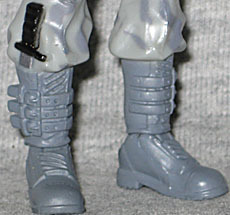 His boots have intricate laces and buckles, and a knife tucked in the right one. There are pouches strapped to his legs, and he has a grenade on his belt. He's wearing a crossed harness over his chest, and though it's a separate piece, it's not really removable. Firefly's paint is handled well, with crisp edges on all those dark camo splotches. His belt is black and silver, his boots and gloves are darker than the rest of the suit, and he has a Cobra symbol on his right arm. The only bit of skin you can see is right around his eyes, which makes sense for a guy so paranoid about protecting his true identity that he learned a form of hypnosis that forces anyone looking at him to forget his face from second to second. That's how he posed as the Arashikage clan's Faceless Master. 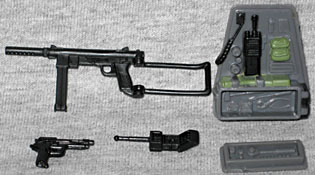 The figure's accessories are mostly updates of the original figure's. He has a small pistol that fits tightly in the holster on his thigh, a small radio, a machine gun with a hinged stock, and a backpack full of equipment. Well, it's just a sculpted part of the backpack, but there's still a ton of stuff there. And unlike previous versions, it gets paint apps to bring out the detail. Nice stuff! Firefly is actually a little more than 4" tall, which means he really towers over the old figures. He get the usual complement of GI Joe TFAC joints, so that's balljointed ankles, hips, torso, elbows, shoulders and head, double-hinged knees, and swivel wrists - plenty for sneaking around and planting bombs.